26 74550-2689 - 7/16 Round/axle Bushing (black). 80044-0199 - Literature Bag N/a. 2 0801-0151 - 25 Amp Fuse. 33 80001-0146 - Spoiler Cover (n/a). 45 80016-0022 - Dash Cover Plate (n/a). 49 80056-0010 - Steering Wheel Cover (n/a). 19 0801-0224 - 8 X 1inch Screw. 28 0801-0309 - No.10 X 3/4in. Screw. 27 73241-4509 - Front Axle . 30 74770-2669 - Post Bushing. 36 74765-2129 - Spark Plug Wire Set. 8 80018-0084 - Door Latch Trigger (n/a). 9 80018-0082 - Door Latch (n/a). 10 80018-0085 - Inner/outer Door Set (n/a). 23 80018-0083 - Door Hinge Support (n/a). 34 80001-0145 - Spoiler Base (n/a). 41 80005-0083 - Body (n/a). 42 80016-0021 - Dashboard (n/a). 80017-0064 - Decal Sheet (vinyl) N/a. 24 0801-0604 - .354 Black Retainer/cap Nut. 22 0801-0202 - (1) # 8 X 1/2 Screw. 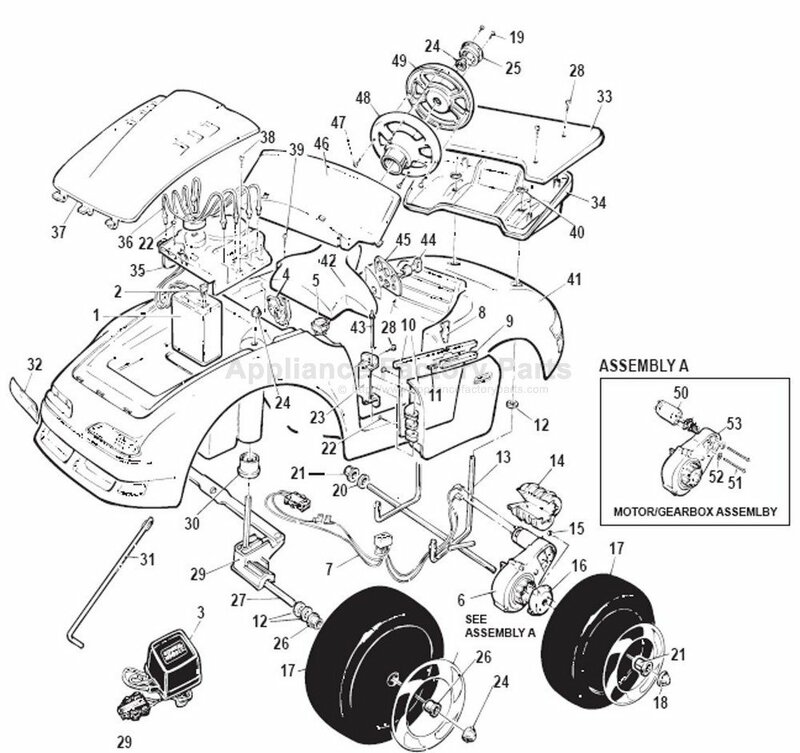 48 80056-0009 - Steering Wheel Base (n/a).